A synopsis of an interview with Jim Rickards, New York Times bestselling author of The Death of Money, Currency Wars, and the soon-to-be-released The New Case for Gold, by Charles Payne at Fox Business. Jim wouldn’t worry about the last recession and whether or not there’s a full recovery. He’d be more worried about the next recession, which probably started in December, and if not then it’ll be the first quarter of this year. The U.S. is heading into a recession. Don’t read too much into the labor statistics. Labor statistics is a lagging indicator — people keep hiring heading into a recession, and that doesn’t turn down until after a recession begins. If you look at manufacturing, world trade and flattening yeild curves you’ll see a lot of data that says we’re heading into a recession. The President is hurting business investment by piling on regulations, but most of the blame you can lay at the feet of the Federal Reserve. The Fed is tightening into weakness. Why do you tighten into weakness? You should never do that. The U.S. had a depression in 1919 that lasted eighteen months. The one in 1929 lasted twelve years. When there’s uncertainty nobody wants to make any commitments. 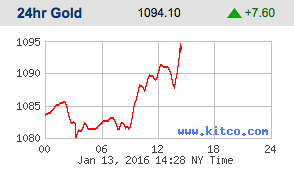 Gold is $1,094.10 U.S. per ounce.